How do you clean rock-climbing shoes, without ruining them? I have a pair of modern leather-and-fancy-rubber climbing shoes made by a major brand. They fit exactly the way I want and the rubber is still sound. But they reek like I exercise in them (with no socks) six days a week. How do I make these expensive slippers smell less horrifying without ruining the rubber or the leather? First, prevention is going to give you the best bang for your buck. Make sure your shoes dry properly between uses by hanging them out, and not keeping them in a bag/trunk/confined space. During your climbing session, it's a good idea to take your shoes off between climbs, or at least once in a while to let them dry out some. For odor control, I find that spray deodorizers can do a good job. I don't think I would use powders, but I'm curious what everyone else says. Once things get really bad, you can give shoes a wash (by hand) using warm water, a mild detergent, and a brush of some sort (an old toothbrush works fine). Wash the insides thoroughly using the brush and soap, it'll take a few rinses to get everything. Allow the shoes to dry completely, put them next to a fan/heater (but not too close). Stuff the shoes with newspaper, and change it often. Generally, I find some brands to be worse for odors than others. I've had good luck with La Sportiva, and a terrible time with Evolvs. This is most likely because of the material (leather vs. synthetic). I use boot bananas to tame the stench! I am still using the same bananas I had bought recently to this first post. I think I am on my 3rd pair of climbing shoes and I have not been bothered by the smell of any of them since. Great long lasting product. Try dusting the inside of the shoes (or outsides of your feet) with chalk (or talcum powder) before using them to soak up some of the sweat, which can then we wiped out with a slightly damp cloth. There are various commercial products you can get to soak up shoe smell while shoes are being stored (not climbing shoe specific). These are usually in the form of an inner sole with some kind of absorbent material inside. You could probably achieve a similar result using bi-carb soda. Try putting a few tablespoons full inside a small cotton bag and insert into the show while not in use. The bag should let air in (so the bi-carb can soak up the smell) while stopping the bi-carb from getting into your shoe. Instead of cleaning them, fill them with cedar balls and hang them. That should eliminate the reek. Be careful to check the health warnings on most sterilizing sprays as most of them state not to get on your skin (I don't wear socks in my climbing shoes). There are also a large number of deodorizers, but they can at times produce a far more distracting scent that will fill a room instead of just filling your shoe. As for freezing your shoes, this can damage rubber and only puts the bacteria in a dormant state temporarily until the shoes are brought back to room temperature. In addition the freezing can damage the adhesives in the shoe. Proper storage: Leave shoes in the open after climbing and in general. Only store in a bag while transporting your shoes to and from the gym or crag. Washing: Rinse and wash with handsoap in room temperature water. Leave to air dry. Heat drying can shrink and deform the shoe. Stuffing: There are loads of products that you stuff in your shoes (bananafingers, sneakerballs, bags of coffee beans even) simply to allow air movement and to absorb smell while also infusing the interior material with a gentle yet pleasant scent. I use old chalk bags that I rinse out and stuff with different things to then stuff my shoes. I've made several different pairs using everything from coffee beans, lavender, potpourri, and cinnamon. I like to mix them up every now and again. They key to all smelly shoes is bacteria. From a prevention perspective, I always wash my feet before they spend a prolonged or arduous of time in shoes or boots. A good spray with an anti-bacteria can do the trick. I've also heard good thing about dusting them with bicarb and then vacuuming it out some time later. A UV-C germicidal light kills the odor-producing bacteria, so used regularly the smelly compounds never build up and your shoes don't stink. It also helps to dry your shoes after use, e.g. in front of a fan. And, as stevemarvell said, wash your feet before you climb. I assembled my own UV-C sterilizer and I can attest that it works. It uses a higher output germicidal bulb than e.g. the SteriShoe brand device, and I don't know how well those low-power ones work. Since UV-C is very dangerous make sure you know what you're doing if you choose to do something similar. I just spray some Lysol into the shoe from time to time after returning home from climbing, and that seems to do the trick. I haven't noticed a downside to this, but perhaps some more experienced climbers can weigh in. 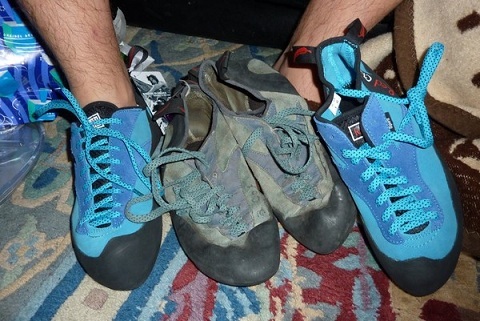 I had a huge problem with smelly climbing shoes when climbing in the gym or on long multi-pitch days. The single most effective thing I have come across is taking the shoes off between climbs/pitches. This seems tedious at first, but once you make it part of your routine it's not that bad. There still is some smell, but the situation has drastically improved. Bring a second pair to reduce smell even further. Kill the bacteria that turns perspiration into a foul smell, sounds crazy but put them in the freezer overnight. This and a through onslaught with any other antibacterial treatments e.g. biological washing powder in luke warm water. As far as I'm aware there is no permanent cure. Do Not put them in the washing machine or use hot water as this may melt the glue that helps to hold the shape of the shoe. I might add that this trick also works wonders for hard to clean drinks containers (empty ones) like Camelbak or Platypus. I like the germicidal light approach mentioned by @MrWizard, but mine is cheaper. Wipe the insides with a cloth soaked in methylated spirits or other denatured/rubbing alcohol. Don't confuse these with petroleum-derived solvents, which are much more likely to damage the shoes. Not the answer you're looking for? Browse other questions tagged rock-climbing maintenance cleaning climbing-shoes or ask your own question.